Memorial Day here in the US can be confusing what with everyone saying “Happy Memorial Day” when in fact it is to remember those we lost on battlefields not so happy at all in fact a rather sad day to reflect upon. Here most enjoy a parade and a cookout and who knows maybe as we gather more can turn their thoughts over to the family members who never came home from war it is wear to start in my opinion. Now Veterans Day is to celebrate all who have served and no parties for that day as most work it to get the day after Thanksgiving off truly confusing. Now to confuse you I have a shot of one of my visiting squirrels contemplating the day before him or her and maybe reflecting upon life while atop of my carved Cardinal. Wish I had a shot of the flag or of soldiers lost but not forgotten . Mom is off chemo as it was making her too sick. My youngest brother and his wife are doing all they can to keep her safe. We will get together on Sunday to watch Tom return to the football field and we will dine on lasagna, made fresh by my brother with hopes mom will eat like our last visit. So hard as we age and no longer care or have the need for eating. You find it hard to sit by, doing nothing. There is nothing human about suffering when your body is under attack. I continue to pray for her to feel no pain and to close her eyes one night and leave us peacefully but you all know the suffering most bodies are put through and I worry sick about her though I continue to put on a smile as she needs to be no sadder than she already is. I had to go and unwind and that has always been on the road, so with dog water packed and batteries charged for all the cameras off we went across the lower half of NH and into VT.
Lots of pockets of amazing color kept my mind busy. We are supposed to enjoy each of our four seasons though all of you know winter is not my thing. I am getting cards printed for 2 Holiday Craft Fairs I will set-up for. They will be of images that will make winter cards. I will sell some original watercolors, I have sold 4 this month already. I have a roof to re-shingle so I hope the sales continue. I will also offer some baby items(crocheted) I will also try to make my table as pretty as I can for the holiday fair. I did not want to do these shows but mom reminds me I need to live and get my name out there. So for her I will keep plugging away. The season will end soon enough for these beauties as the drought has been rough on the land and my well. Mom started Chemo yesterday so far so good but I am just trying to keep the faith. I was invited to show my Watercolors last Wednesday in Dover NH and will again this Wednesday evening from 6 to 9 p.m. Myrtle Street Gallery on the sidewalk outside of the Chop House come by if you are in the area. Mine is a starving artist sale very inexpensive art so I can continue to paint. My town celebrated it’s 275th Birthday with a day long celebration so much fun after working on committee for almost 2 years. We even ended the night with our very own Fireworks show. I am joining a friend on Tuesday and we will paint our dogs well I should say attempt to results here if it looks something like JT. Hope you are all doing OK I will see if I can find you on my WP Reader. Life is moving too quickly at this time of the year I am already missing the long lazy days of summer and all that lovely light. We had a wonderful Thanksgiving a very long day for me but so worth my effort. Got up early add the cold sausage stuffing to my cold turkey and place it into the oven to roast while I drove down to my Moms to take here and all of her tools like wheel chair, walker and even the toilet well some stand alone one with legs no good for stairs or sitting on chairs with no arms for leverage I wanted her to feel safe here. so one hour down and one hour back safe and sound. She then made the gravy for us and I did more preparing and readying the place for a small feast. I invited a friend who is in our garden club with me to join us as well. The dog was so happy to have so many people around the table. The meal came out perfect and we had so much to be thankful for as surly you all did. After all the desert had been tried I loaded her things back into the car for the hour ride back south this time I took the dog to keep me company on the way home. Like I said very long day but so happy she could hang out at my peaceful place one more time as it had been years since her last visit shortly after we lost Dad. On my way back down to Moms my friend and I finished what she had started for decorations around town while Mom and the dog watched from the car. All lit and off we went. The world is so scary these days and it makes me that much more grateful for days like we enjoyed. I hope you are all safe in light of the world’s uncertainty. Stay aware of your surroundings as the holy holidays are upon us for there are those who want nothing more to take that from us. Lone wolfs or full fledged attacks no one is safe. I hate war. I hate that countries continue to posture and display might to the detriment of so many others. Taking freedoms from anyone is just not right. Can you imagine if there ever was to be Peace On Earth Goodwill Towards Men. May you be filled with Joy and wrapped in Love we all deserve that. I am missed I can assure you by all who love me but since they love me they knew I had to try to be there for her after all of the BS that has gone on. I paint and weed then cook and clean then eat and laugh and talk about the old days and I miss you all and am now finding time to try once again to catch up with you little by little I will. Life is hard isn’t it truly I just do not know what will happen next only that my hope is to get through it. Sorry I have not been here of late Facebook is easy from phone to check on those on my list but I can not blog from it yet. Still sitting with Mom for 10 hours a day with just under a hour each way to travel from my place not complaining though as it was 2 1/2 hours each way when she was in rehab. Still sitting is taking a toll on not only my knees but with her still in a cast unable to use her $200,000.00 knee it is getting crazy :(. Then Friday night my man and best friend called me while I was with mom and said he lost feeling in left arm and hand I thought stroke and begged him to call 911 but he chose to go see his primary care nurse who then called me to inform me they were calling 911 and sending him to hospital mind you I am all alone with mom and unable to leave. I still don’t drink or have gray hair but I swear there may be a chance for both. Sister in law came in and I took off for home and hospital. First I had to let the pets out and then feed them. I called a friend to bring me to pick up his truck at doctors office then it was time to drive further east to see what was going on with him. It was so late in the day I had just missed him in ER and had to wait till they had him in ICU before seeing him which by the way almost did not happen as visiting hours were now over. I walked in to seeing him lying there and so scared and worried he was not using what little oxygen his heart was making to think clearly he told them he wanted to die. REALLY? Not on my watch! I asked what was wrong and they said one part of his heart was not talking to the other half he was in big trouble and he had already refused a way to help himself. I begged him to stop worrying and let them help him and in the end he did. They placed a temp. pacemaker to make the two halves of the heart get along I got the call just before 1 AM that it was a success and his heart rate was now 80 and not the 25 I had last seen him with and them with a crash cart ready to save him over and over till a team could be called in on a Friday night to save him. He hates doctors and hospitals I explained we all do but to be happy when they can fix a problem so dire as him within a hour he should be thanking not only God but all of them who even had me scared. Last night while getting into the hospital parking lot the phone rings and it is Mom in tears. Seems her 14 year old house cat taken from his home to live with my mom at my brothers place had been allowed to exit the home. He doesn’t know the world outside and as of last night still no kitty. Mom is so sick with worry and I am so sad as I know this will be yet another huge setback in her plan to get well. I always say my prayers for others and never ask anything for myself but today I am asking for no more bad news here or in the world my heart just aches. So if you think I have been ignoring you I haven’t been I just am never here to catch up with all of you. I hope you are well and staying safe. Christmas Was Great How About Yours? Well we woke early to let JT open her gifts and then we got ourselves ready for the half hour ride to my brothers. I made a 10″ Cheese Cake, with a home made cranberry sauce topping, just enough to swirl into the top a letter M, either for our last name or MERRY lol. Sorry no photos I promise next time I will. This better be a toy or you will have to call Santa back! The New Year is getting close! I will be busy wrapping and baking today for our family gathering tomorrow. Please remember our families are made up of many personalities and as you come together or spend it alone know you truly are not alone and that no family is like the TV SITCOMS, that is just writers wanting a perfect family as well 🙂 we see how the actors truly are not who they portrayed, so keep it real and try to have a wonderful holiday. Stay safe in this crazy world of ours, hold those you love tightly because we all know we are not promised a tomorrow. My First Class Was A Blast! I signed up for a free, 6 or 8 week class, presented by a local newspaper here in New Hampshire. It is about writing Memoirs. Our first homework is to write a piece on a harrowing experience lol how do I choose? We could also do it on a person we had a relationship of some kind with and how that changed us. Both tough for me as most of my long time followers know. There was another who had written lots of poetry and was interested in this writing form. The lady on my right new our teacher and she was not sure if she wanted some day to write a novel, autobiography or memoir but she was all in. I said I was there to learn the art of telling a sad story and capturing the reader and in the end finding joy in the read 🙂 I am always looking for the Happy Ending. The woman to my left has many amazing stories to tell as she has also lived a life such as mine full of very colorful people. The next lady wrote on her laptop the whole time in class maybe she will write of her day in class as I am 🙂 The last student that arrived a half hour late was close to the other man’s age and seemed to have the same intent leaving a story for those in his family who followed so the story of who they all were would not be lost. I want that too but that will be in a different form I think but this class will teach me a way to keep the reader engaged as they flip the pages of a book I hope to write you know the type old photos, family stories and recipes passed down through the ages. No war stories for me as sadly I fought a long war and it left me broken but here. So yes I had fun and I came home to quickly write three pieces that we will read aloud and discuss so we can learn what to do to make them better. Here on my blog it is easy I am talking to friends. Now comes the good part she says to me “Eunice you have some extra homework I want you to read Liars Club” lol maybe she didn’t believe me 🙂 Have you read it? Is it good? I must head to the library and see if they have it and hope I can get through it to the end by next Wed. night. I am off to see my son tomorrow and sadly mom has bowed out from the drive down she is just not feeling well with all her medical issues I am sad but OK and he doesn’t know I am going so he will not be disappointed in no meeting her. I will also be down the street from the 9-11 Memorial in NYC and maybe as I leave the city for home I can see the lights in the night sky. I continue to pray for Peace around the world and for countries to get along but after the speech last night I am even more scared of the future for our people and the babies coming into the world today. Me again, yes the birth mom of a very smart and oh so talented guy. He has put his nose to the grindstone as they say and has made a connection with a very important person in the art world. Anyone who has seen what he can do with a spray can, will not be surprised that he is making it once again into the big time, NEW YORK CITY. He was there once for a charity auction, one painting on the wall making a huge statement and bringing in so much more money than he ever dared to dream. They had to give him a exhibition 🙂 This one is being curated by a man by the name of Peter Doig have you heard of him and the records he set with the sale of a painting titled “White Canoe” never mind the rest of his body of work. My hope is he is a good man with only Mike’s best interest at heart. From what I have read about Mr. Doig I am sure he will be in great hands but moms worry and most only want the very best for their child, don’t they. So yes I am so very proud of him and all the years he has worked hard to get noticed and now he has made it to the ultimate place to be seen, NYC! So if you are free on Friday, September 12 and are in the neighborhood of White Columns Art Gallery please stop in for his Exhibit Opening from 6 to 8 pm. I will add the link to gallery page for the dates his works of art will be shown with them. I wish him the very best and a wonderful showing! Yes he has had plenty out in JH WY with all of the friends and locals there but NYC and say London are the place to be! Just checking in and reading blogs I follow adding a like to say I have Been There! Mom is doing good! We went down to have dinner with her and I moved things up and away she doesn’t need right now and lowered items to make it easy for her to reach while holding onto the walker. She is doing so much better I swear I never would see her come back as she has it reminds me of the will to live and how truly strong it is. Philomena shares the story of a young unmarried pregnant girl who, after being sent in disgrace to a convent by her father, agrees to put her son up for adoption. 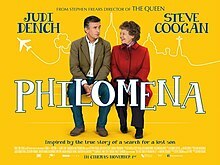 Fifty years later, after seeking help from recalcitrant nuns to find her grown son, Philomena (played by Judi Dench) enlists the aid of a journalist (Steve Coogan) to help her track him down. This touching comedic film, based on a true story, is not a documentary ~ it takes dramatic license and liberties in depicting historical events. The creative blending of fact and fiction enhances the story line, allowing us to see how Philomena reconciles the nuns’ apparent lack of compassion without losing her deep and abiding faith. Judi Dench reveals the amazing power of forgiveness to transform and heal. Traditions: we’ve all got ‘em. They might be family dinners on special occasions, or having a particular kind of cake on your birthday (Jeanne Cake, natch), or popcorn at the movies, or meeting your friend for a 5k run in the park, rain or shine, every Sunday morning. What are your favorite traditions, large and small? What is it about your traditions that keep them going strong for you? I grew up with so many Family Traditions. We used to go to both sides of our family, for holidays. They would split them up so we would know our Grandparents, Aunts and Uncles as well as our Cousins. Many miles were laid down. Traveling from our state to theirs. Even with family scattered our parents made the effort for us to be together. I never knew there was any other way to live. Flash forward fifty eight years from yesterday and really I have no real family. No closeness. Brothers, well two of them, moved to the south and one lives 20 minutes from me but I may as well be on the other side of the world. He is the baby, now 40+ years old but clearly in charge of our mom. I was born first and always cared for the three of them but since dad passed away ten years ago I have been left to make my own traditions as each holiday comes around. Traditions are a part of each of us, be it currant or just a memory. I now place a large turkey in the oven, stuffed with deliciousness, no longer getting dressed to see the family for holidays but getting dressed to head out the door. I go for walks with the dog and my special guy. We time it perfectly to arrive back home, as a turkey really just needs one nice basting to crisp up the skin, so it will look beautiful as I sit it at the table for two well the cat and dog will be allowed some on their plates when dinner is done. I make all the traditional side dishes from my childhood and some he remembers as well, see he has no family left at all. We have each other. We happily set out making new traditions together. I hoped I would never write this to you. In a little less than an hour, I’ll be strapping myself into my old plane and pointing my nose westward. I’ve seen the orders. I think it will be for the last time. And, so, suddenly I find my life stripped away, like the branches of an old, black tree. All that matters is that I write this to you. I know that you won’t remember me. Not really. When I spent three days with you last year when you were 6 months old, and although you can’t yet understand it, I loved you more then than you might imagine loving anybody right now. My name is not one I would have chosen. It is my Mother’s first name as well as her Mom’s. Funny thing is when Dad met Mom she told him her name was Sandy! So they are about to say their vows when the minister asks him if he will take Eunice, he blurts out who is THAT! Guess he loved her and her name so much he bestowed it on me, with his mom’s name for my middle one. Neither fit who I think I really am but with that much love felt for names and the people who carried them before me, I grew into them. I have a few AWARDS TO ACCEPT let’s start with last one first THANKS SO MUCH! The WordPress Family Award is reserved for folks in Cyberspace who are unceasingly kind, sympathetic, encouraging, and open to laughter – and who keep each other going by sharing, commenting, and making personal connections even though they may actually be virtual strangers. Nominate 10 others you see as having an impact on your WordPress experience and family. Let your 10 Family members know you have awarded them. Never have I been great at doing these and I even forgot how to grab the url for award photo all I kept getting was the one for this lovely lady at number 1 slot’s info 🙂 yes I have been away and for that I am so thankful I am filled with so much love and joy I can hardly stand it but I will it beats hatred for one’ self hands down! You have helped me get through this amazing year of letting go as did the rest of you not listed here and the men too I know you stopped by and left your mark. One month from now I will have been here a YEAR man you all really are family I have a brother I have not seen in over 10 years 😦 that will change too! So back to you listed above you took a busted up female trucker in and gave me hope for a better life and yes it was hard at times but feeling safe I began to let go and let God and with my son’s help found a new set of tools to live once again oh and chats with him again are icing on the cake!